Last June, First Nations representatives gathered together with federal officials to announce a historic agreement to work collaboratively to protect and manage the North Pacific Coast. 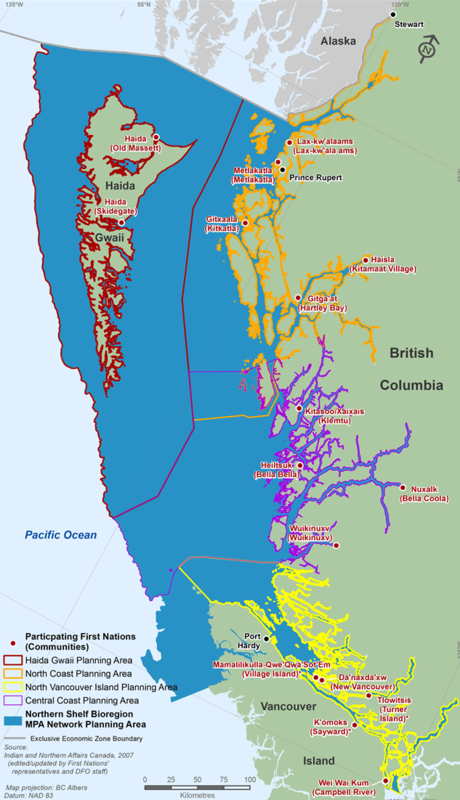 Focusing on a vast region—from the top of Vancouver Island to the Alaska border, including Haida Gwaii (see map below)—the Reconciliation Framework Agreement for Bioregional Oceans Management and Protection, or Oceans RFA, strives to create an integrated and effective planning regime. The framework for planning, based on a nation-to-nation governance structure, is designed to improve marine management in tangible ways. Beyond providing a model for collaborative stewardship of marine ecosystems, it also aims to increase safety in coastal communities by improving emergency response capabilities through the Regional Response Planning (RRP) pilot project. “The goal of the RRP is to create integrated incident response plans that can be applied across the entire region,” says Steve Diggon, who represents CFN-GBI on the project’s regional working group. Through several levels of planning—from high-level discussion groups to technical teams for on-the-ground implementation—the project will determine how Nations and federal and provincial agencies can work together to act quickly and effectively in the event of a marine spill or similar incident. Diggon says projects like the RRP are helping to build a common understanding, as well as new relationships and increased trust, among those at the planning table—including First Nations, Coast Guard, DFO, Transport Canada, BC Ministry of Environment and other agencies. And each group involved brings their own unique background, knowledge and experience.